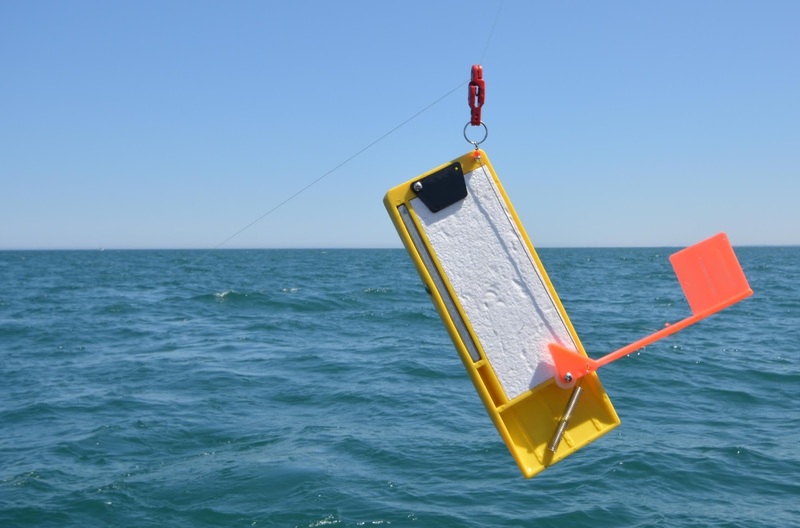 One of the reasons that in-line planer boards like the Off Shore Tackle OR12 Side-Planer are so popular is these fishing aids can be rigged a variety of ways. The Fishing 411 team rigs our boards three different ways depending on the species we are targeting and the type of trolling on the docket. One of the most popular and “classic” rigging methods for in-line boards involves using an OR16 (red) Snap Weight Clip on the tow arm of the board and also a second OR16 mounted to a split ring at the back of the board. The OR16 has a small plastic pin in the middle of the rubber pads. When the line is placed behind the pin and the release closed, this rigging method virtually guarantees that the board is going to remain on the fishing line. This is the rigging method I use most often when fishing lead core or copper line set ups that feature a pre-determined amount of sinking line and a monofilament backing. The lead core or copper line is deployed and the planer board is attached to the monofilament backing using both OR16 clips. To stack multiple lines per side of the boat, I simply use a modest amount of lead core as my outside line and then select progressively deeper running set ups as my middle board and inside board. A good set up for trout and salmon involves using a five color lead core line as the outside line, a 10 color lead core as the middle board line and a 300 copper as the inside board line. The five color runs about 20 feet down, while the 10 color fishes about 40 feet down and the 300 copper is the deepest line at approximately 60 feet down. 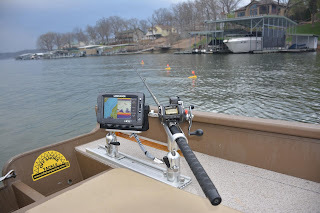 With this set up if a fish hits the outside or middle board lines, I can reel the fish and board right over the adjacent line without fear of tangling my sinking line set ups. Slick and effective. 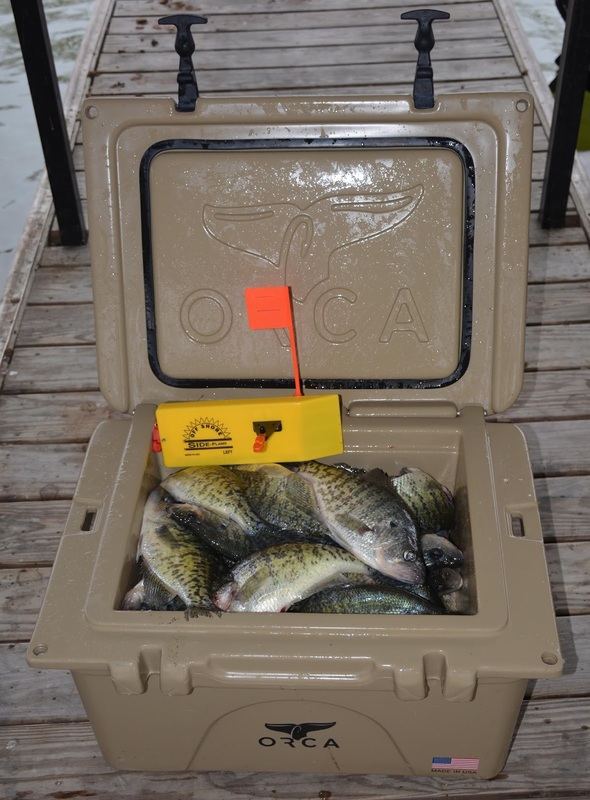 Rigging an in-line board with an OR18 Snapper Release on the tow arm and an OR16 Snap Weight Clip at the back of the board is another popular option. The cam operated OR18 release is the industry standard for holding hard to grip super lines like Spectra braids or Microdyneema lines. Anglers who troll using super lines as their main line swear by the OR18 Snapper. Also, anglers who use super lines as the backing line on lead core or copper line set ups also find that the OR18 saves the day. having to clear lines to fight fish. A growing number of anglers are rigging their boards with an OR19 (orange) release on the tow arm and a OR16 Snap Weight Clip at the back of the board. This is precisely how the Off Shore Tackle board comes in the package and this rigging option provides anglers a wealth of trolling options. The OR19 has the same spring tension as the OR16 but without the plastic pin. This release also can be adjusted for spring tension by sliding the spring forward for maximum pressure or sliding it backwards to reduce the spring tension. This simple tension adjustment option allows the OR19 to function as a line clip that holds the line fixed in place or as a line release that enables the angler to trip the release from the tow arm of the board. To rig a board to release set the OR19 on the tow arm in the lighter tension setting. Next put the line in the OR16 mounted at the back of the board and be sure to place the line behind the plastic pin. Rigged in this fashion when a fish is hooked, the angler can trip the board by simply snapping the rod tip to release the line from the OR19 on the tow arm. The board will swing around in the water and is now connected to the line via the OR16 at the back of the board. Once the board is tripped, it will begin to slide to the back of the boat where it can be reeled in without having to clear other planer board lines. This set up works amazingly well when trolling multiple lines per side for crappie, walleye, brown trout and steelhead. of why in-line boards are so popular coast to coast. There’s also a simple trick for getting the line to release from the OR19 smoothly even when the OR19 is set the the heavy tension setting. Wrap the line around your finger and put about four or five twists into the fishing line. Place these twists of line into the OR19 release, leaving a small loop of line exposed. Rigged this way the OR19 will hold the board securely even in rough seas or at high trolling speeds, yet the angler can trip the board easily by simply giving the rod tip a quick snap. The A, B, C’s of planer board trolling makes it possible for anglers to troll in-line boards a multitude of ways. Truth be told, the options for rigging in-line boards are almost endless, but these three are among the most popular and a big part of the reason why Off Shore Tackle is the Leader in Trolling Technology.